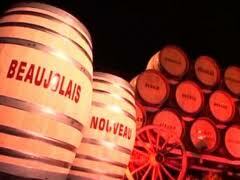 The France Insider: Happy 60th Birthday, Beaujolais Nouveau! 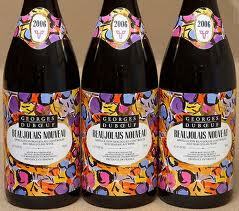 Happy 60th Birthday, Beaujolais Nouveau! Call it fresh, celebratory wine or phony, immature “cookie dough” (as one critic nicely put it), there’s no doubt the young Beaujolais Nouveau has become one of the wine world’s most successful stories. Last Thursday, precisely at one minute past midnight, thousands of barrels were festively breached with the traditional cry: Le Beaujolais nouveau est arrivé! Revelers across the globe gathered in bars and restaurants to celebrate the wine’s 60th anniversary. Before 1951, France didn’t allowed the vin de primeur (newly-harvested wine) to be sold a month before wines are meant to be kept. 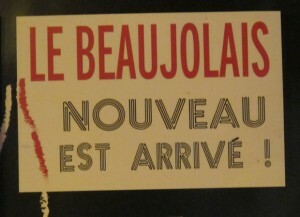 But once the ban was lifted, the race to bring bottles to Paris began, and thus Beaujolais Nouveau Day was born. Now, every third Thursday of November marks a ritual of merriment and red wine galore. Originally drunk to celebrate the end of the harvest, the wine, made from Gamay grapes, saw an explosion of popularity in the 70’s and 80’s thanks to genius marketing campaigns, and spread to Japan, US, Germany and beyond. Although bottles are currently being uncorked, the global frenzy has since decreased, mostly in part to quality and overproduction. Sales have taken a serious hit, from 72.4 million bottles in 2002 to approx. 36 million bottles last year. Still, a survey reported that 60 percent of the French intended to celebrate the wine's release this year. And I’m certain the rest of the world followed. 2011 might just be a very fortunate year. Due to excellent weather conditions, the grapes of the wine matured three weeks earlier than 2010. As a result, this year’s wine boasts a richer color and strong fruity flavors of cherries and strawberries, among others. It also pairs well with just about any kind of food, and is best served slightly chilled. They’re inexpensive, too, costing between $10 and $13 a bottle. Although enthusiasts shy away from this red, wine drinkers should try to appreciate Beaujolais for what it is: versatile, casual and above all, fun. But remember, since the fermentation process is short, you must consume it rather quickly. So with all due respect, chug your beverage.